Captures the contents of the screen with a single keystroke. The captured screen can then be sent to the printer, or saved to disk as a file in 6 different graphics file formats. 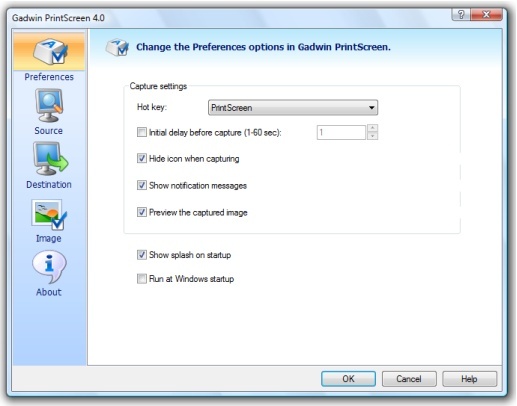 Gadwin PrintScreen can capture the entire Windows screen, the active window, or a specified area. The hot key defaults to the PrintScreen key, but users may also define other keys to initiate a capture. Gadwin PrintScreen allows you to e-mail the captured images. ...... There are also six different image formats to choose from, and each one can be resized. With all the customization capabilities, what more could you ask for? * Full screen of data can be put only on the clipboard. Qweas is providing links to Gadwin PrintScreen 4.5 as a courtesy, and makes no representations regarding Gadwin PrintScreen or any other applications or any information related thereto. Any questions, complaints or claims regarding this application Gadwin PrintScreen 4.5 must be directed to the appropriate software vendor. You may click the publisher link of Gadwin PrintScreen on the top of this page to get more details about the vendor.